Mercedes Clemens was a Maryland entrepreneur with a thriving massage practice in Rockville that offered both human and animal massage. 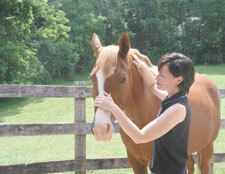 In addition to being a licensed massage therapist, Mercedes had more than 30 years of practical experience as a horse owner and rider, had been certified in equine massage—a growing practice that can alleviate physical discomfort and calms horses, making them easier to handle—and had even taught animal massage to others. Despite these qualifications, Mercedes found herself whipsawed by two licensing boards intent on protecting a veterinary cartel from competition. According to the Maryland State Board of Veterinary Medical Examiners, Mercedes could not practice animal massage without spending a fortune on four years of veterinary school. Further, in February of 2008, the Maryland Board of Chiropractic Examiners ordered Mercedes to stop practicing equine massage and take down her website or else lose her license to massage humans, which made up the bulk of her practice. On June 10, 2008, the Institute for Justice filed suit in Montgomery County Circuit Court in Rockville on behalf of Mercedes Clemens, challenging Maryland’s animal massage regulations as a violation of fundamental constitutional rights. After the lawsuit was filed, the Veterinary Board immediately backed down and was dismissed from the case, but the Chiropractic Board maintained its cease-and-desist order against Ms. Clemens for another year under the absurd argument that anyone in Maryland was permitted to massage animals except people who were also licensed to massage humans. On July 30, 2009, Judge David Boynton of the Montgomery County Circuit Court ruled that the Chiropractic Board had no authority over the practice of animal massage and had acted illegally in shutting down Ms. Clemens’ business. Thanks to this ruling, Ms. Clemens has begun rebuilding her practice and reconnecting with her former clients. “Animal massage therapist” may sound like an unusual occupation, but for Mercedes Clemens of Gaithersburg, Md., it was an exciting new career that allowed her to combine her entrepreneurial spirit with a lifelong love of horses. But now Mercedes has found herself whipsawed by two government licensing boards intent on shutting her down. In February 2008, Mercedes was contacted by both the Maryland Board of Chiropractic Examiners—the board that licenses massage therapists who work on humans—and the Maryland State Board of Veterinary Medical Examiners. Although Mercedes has specialized training in animal massage and is a licensed massage therapist, these boards consider animal massage to be “the practice of veterinary medicine.” They have threatened to revoke Mercedes’ massage-therapist license and charge her with the unlicensed practice of veterinary medicine, which could subject her to thousands of dollars in fines, unless she restricts her practice to massaging humans. A letter from the president of the Veterinary Board even threatened non-veterinarians who practice animal massage with criminal prosecution. Nobody thinks that only doctors should be allowed to massage humans, and it is equally absurd to insist that only veterinarians can massage animals. But the absurdity of their position has not stopped the Veterinary Board from attempting to monopolize the practice of animal massage, nor has it deterred the Chiropractic Board from pressuring their licensees to restrict their practice to humans. Animal massage is safe and involves no invasive procedures or medication. The hands-on training required to learn the occupation can be acquired in a short time at one of the many private schools that teach animal massage, without attending four years of veterinary school and taking on tens of thousands of dollars in educational debt. That is how Mercedes learned her trade, and it is a level of training that her clients—who are in the best position to make decisions about their animals’ well-being—are obviously comfortable with. On June 10, 2008, Mercedes joined with the Institute for Justice in a lawsuit to fight back against these abusive regulators and to secure her right to earn an honest living in the occupation she loves. Animal massage has existed in one form or another for as long as animals have been domesticated. The modern era of animal massage, however, began in 1970 with a physical therapist and massage therapist named Jack Meagher. Meagher, who until that time had worked exclusively on humans, was approached by a friend with a lame quarter horse who wanted to see whether Meagher’s techniques could be used on animals. Meagher successfully treated the horse and by the 1980s had become so well known that he was working as a massage therapist for horses on the U.S. Olympic Equestrian Team. Since that time, the practice of animal massage has only grown: schools teaching the practice have sprung up around the country and many massage therapists now treat animals of all kinds. There are many reasons why owners might want to purchase massage services for their animal. Many of these are the same reasons that humans get massaged: to alleviate sore muscles, to prepare for or recuperate following athletic events, or simply to ease tension and relax. Due to their build, horses are thought to particularly benefit from massage. As anyone who has been around horses knows, they are athletic and extremely muscular. Indeed, skeletal muscle makes up approximately 60 percent of a horse’s mass, compared to 30-40 percent for healthy humans. Horses are also prey animals, which makes them naturally skittish. Regular human contact through massage is thought to calm horses, improving their temperament and making them safer to ride. Mercedes Clemens is a life-long Maryland resident who has owned and ridden horses since childhood. After spending 15 years in the worlds of graphic design and publishing, she decided that she wanted a career change. Building on her long-standing interest in and love of horses, she began to study the growing practice of equine massage. In 2006, Mercedes successfully completed two courses in equine massage and received certifications from Equinology, Inc., a private animal massage school. After completing her course work, she also became a tutor for students working on their certifications in equine massage. In 2007, Mercedes successfully completed course work at the Potomac Massage Training Institute and became a licensed massage therapist in Maryland. She opened up a massage practice operating out of a medical office in Rockville, Md. She also provided seated massage services to area businesses. In addition to her regular massage practice, Mercedes had previously set up a website offering her services in equine massage and begun to obtain clients in Maryland. Up to this point, Mercedes’ story is a classic example of entrepreneurship in action. Through hard work and business savvy, Mercedes was satisfying an underserved market, to the benefit of horses and their owners. It wasn’t long, however, before the bureaucrats caught wind of Mercedes’ successful business and came to shut her down. Until recently, the Maryland State Board of Veterinary Medical Examiners would have had no problem with Mercedes’ new business. As recently as September of 2003, the Board was on record as stating that it did not consider animal massage to be the practice of veterinary medicine (and therefore subject to regulation by the Board) as long as massage therapists were careful to limit the claims they made about the benefits of massage, something Mercedes was scrupulous about. As happens too often, however, industry insiders saw an opportunity to profit by shutting out competitors. In this case, it was the American Veterinary Medical Association, which adopted a new model practice act in November of 2003 that included a range of previously unregulated alternative therapies—including any “manual or manipulative therapy”—within the definition of “veterinary medicine.” Under this revised interpretation, Mercedes cannot practice animal massage without first attending four years of veterinary school at an approximate cost of $150,000 and becoming a fully licensed Maryland vet. Tellingly, though the Veterinary Board claims that Mercedes was practicing veterinary medicine, it did not approach Mercedes directly. Perhaps recognizing the weakness of their claimed monopoly on the benign practice of animal massage, the Veterinary Board has instead teamed up with a group in a better position to exert pressure on Mercedes: the Chiropractic Board that controls her license to practice massage therapy on humans. In February of 2008, Mercedes received a cease-and-desist letter from the Maryland Board of Chiropractic Examiners, ordering her to stop performing animal massage and to take down her website. Mercedes initially disputed the letter, arguing that the law did not apply to her practice, but the Chiropractic Board made its position clear: unless Mercedes stopped practicing animal massage, she would face immediate revocation of her license to practice human massage therapy, which is her main source of income. With no other choice, Mercedes stopped performing animal massage and stopped advertising the service on her website. Maryland has no laws either licensing or expressly prohibiting the practice of animal massage. Nevertheless, the Veterinary Board has adopted an expansive interpretation of “veterinary medicine” that sweeps in practically any health-related contact with animals, including animal massage, regardless of the level of skill required or the safety of the procedure. At the same time, Maryland law specifically exempts from its definition of “veterinary medicine” a number of other practices that are more dangerous than animal massage, including certain livestock management practices and the shoeing of horses. Maryland law even allows alternative therapies like animal acupuncture and acupressure without requiring practitioners to obtain a veterinary license. It simply makes no sense to treat paid animal massage as “the practice of veterinary medicine,” while these other activities remain exempt. Compared to these activities, animal massage is unquestionably safe. Mercedes uses no more pressure when massaging a horse than she does when massaging a human. She has never injured a horse during a massage, and in the more than 30 years she has spent around horses, she has never even heard of such an injury occurring. By contrast, improperly shoeing a horse can lead to severe injury, infection or even death. Equally absurd is the Chiropractic Board’s application of Maryland’s massage-therapy regulations. All massage therapists in Maryland must be licensed by the Maryland Board of Chiropractic Examiners. The Board defines “massage therapy” as “the use of manual techniques on soft tissues of the human body including effleurage (stroking), petrissage (kneading), tapotement (tapping), stretching, compression, vibrations, and friction.” The Board argues that Mercedes cannot legally perform massage therapy on animals because the definition of massage therapy refers only to “soft tissues of the human body.” According to the Board, by massaging animals, Mercedes is exceeding the scope of her license. This argument—that any activity not expressly permitted by the massage regulations is prohibited—is precisely backwards. In America, no one needs permission from a licensing board to engage in unregulated activity. To the contrary, the definition of massage therapy should limit the Board’s authority to discipline its licensees; the use of manual techniques on anything other than the human body should be beyond the Board’s purview. The Board has no more authority to revoke Mercedes’ license for engaging in the unlisted activity of animal massage than it would if she engaged in the unlisted activity of taking a walk on a sunny day. Increasingly entrepreneurs like Mercedes are finding their right to earn an honest living is subject to the caprice of occupational licensing boards. Over the past 50 years, the percentage of the workforce in licensed occupations has skyrocketed from five percent to almost 30 percent. But under Article 24 of the Maryland Declaration of Rights, Marylanders have the right to economic liberty—the right to earn an honest living free from unreasonable regulation. This constitutional provision requires that regulations have a rational basis and satisfy “equal protection” by treating similarly situated people alike. Maryland’s regulation of animal massage therapists fails both of these standards. Maryland’s regulation is not rational because it is not tied to protecting animals or their owners from malpractice by unskilled massage therapists. Veterinarians receive little or no training in animal massage during veterinary school, so there is no basis for requiring someone to become a veterinarian if she only wants to massage animals. Indeed, the practical consequence of these regulations is not that Mercedes’ former clients receive better service at the hands of veterinarians, but rather that they receive no service at all. There are few vets that perform animal massage, and Mercedes is unaware of any in Maryland that do so at rates competitive with hers. As a result, the horses Mercedes previously massaged are simply going without treatment. Maryland’s law also violates equal protection because it arbitrarily denies animal massage therapists the same freedom from veterinary licensure requirements that is enjoyed by those engaged in other non-veterinary animal treatments such as livestock management practices, horse shoeing or the filing of horse teeth. Indeed, Maryland law allows acupressure—a practice that similarly involves the application of pressure to points on an animal’s body—to be performed without a veterinary license. These irrational distinctions violate the fundamental equal-protection principle that the law not treat similarly situated persons differently. By granting the exclusive right to perform animal massage to a group that has no special expertise in the practice, Maryland’s law also violates Maryland’s constitutional prohibition on state-granted monopolies. Article 41 of Maryland’s Declaration of Rights—which has been part of every Maryland Constitution since 1776—declares that “monopolies are odious, contrary to the spirit of a free government and the principles of commerce, and ought not to be suffered.” The negative effects of state-granted monopolies on commerce are as salient today as they were in 1776. Maryland’s absurd licensing scheme is a lose-lose-lose for entrepreneurs, horse owners and horses. It puts those with the experience and skill to care for horses out of work, while forcing Maryland horse owners to pay more for lower-quality care, or go without care altogether. Mercedes Clemens eagerly looks forward to the day when she can again practice the occupation she loves. But Mercedes’ fight is about more than just the right to perform animal massage. And although veterinary boards across the nation have moved aggressively to cartelize even the most obscure animal treatments—as IJ’s cases fighting the regulation of horse-teeth floating show—her fight is broader than any one entrenched interest group. By taking on Maryland’s Chiropractic and Veterinary Boards, Mercedes wants to strike a blow for all entrepreneurs who want nothing more than what the Constitution guarantees them: the right to pursue an honest calling free from unreasonable government regulation. Founded in 1991, the Institute for Justice is a public interest law firm that advances a rule of law under which individuals can control their destinies as free and responsible members of society. Through litigation, communication, outreach and strategic research, IJ secures protection for individual liberty and extends the benefits of freedom to those whose full enjoyment is denied by government. IJ filed the case of Clemens v. Maryland State Board of Veterinary Medical Examiners, et al. on June 10, 2008, in the Circuit Court for Montgomery County in Rockville, Md. The lead attorneys in this case are Scott Bullock, senior attorney at IJ’s headquarters in Arlington, Va., and Paul Sherman, staff attorney. Timothy Maloney and Joseph Creed of the Greenbelt, Md., law firm Joseph, Greenwald & Laake, P.A., will serve as local counsel. Swedenburg v. Kelly—The Institute for Justice successfully waged the nation’s leading legal battle to reestablish the American ideal of economic liberty when, on May 16, 2005, the U.S. Supreme Court struck down discriminatory laws that existed only to protect the monopoly power of large, politically connected liquor wholesalers. Vintner entrepreneurs Juanita Swedenburg and David Lucas joined wine consumers and IJ in filing this federal lawsuit as a challenge to the ban on direct interstate wine shipments in New York. The case raised issues of Internet commerce, free trade among the states, and regulations that hampered small businesses and the consumers they sought to serve. Craigmiles v. Giles—The Institute for Justice secured a federal court victory striking down Tennessee’s casket sales licensing scheme as unconstitutional, a decision that was upheld unanimously in December 2002 by the 6th U.S. Circuit Court of Appeals and not appealed. This marked the first federal appeals court victory for economic liberty since the New Deal. Franzoy v. Templeman—IJ represented two interior designers in successfully challenging New Mexico’s titling law, which prohibited anyone except government-licensed interior designers from using the terms “interior design” or “interior designer.” The New Mexico Legislature amended the law, doing away with the speech restriction. The Governor signed the bill into law in April 2007. Rissmiller v. Arizona Structural Pest Control Commission—In the fall of 2005, the Institute for Justice Arizona Chapter (IJ-AZ) challenged the state’s requirement that gardeners and landscape maintenance workers obtain three separate licenses simply to kill weeds with over the counter products. As a result of this litigation, gardeners throughout the state are now free to control weeds using products available to the average consumer. Diaw v. Washington State Cosmetology, Barbering, Esthetics, and Manicuring Advisory Board—In March 2005, after being sued by the Institute for Justice Washington Chapter (IJ-WA) just seven months earlier, state bureaucrats exempted African-style hairbraiders from discriminatory cosmetology-licensing requirements. Armstrong v. Lunsford—The Institute for Justice opened the hairbraiding market in Mississippi in 2005 when the state Legislature responded to this lawsuit, filed in federal court in 2004, by allowing IJ’s clients to continue their entrepreneurship without obtaining a needless government license. Alf v. Arizona Structural Pest Control Commission—In 2004, IJ-AZ persuaded Arizona bureaucrats to change their position on requiring teenage entrepreneur Christian Alf to obtain a government-issued license for his after-school handyman business helping local residents prevent roof rats. Farmer v. Arizona Board of Cosmetology—In 2004, as a result of an IJ-AZ lawsuit, the Arizona Legislature exempted hairbraiders from the state’s outdated cosmetology scheme. ForSaleByOwner.com Corp. v. Zinnemann—Also in 2004, the Institute for Justice prevailed in persuading the U.S. District Court for the Eastern District of California to stop the state of California’s efforts to impose real estate broker licensing requirements on an informational website. Wexler v. City of New Orleans—In 2003, the Institute for Justice successfully persuaded a federal court to strike down an absurd ordinance that prohibited booksellers from selling books on city sidewalks without a government-issued permit. Clutter v. Transportation Services Authority—In 2001, IJ defeated Nevada’s Transportation Services Authority and its entrenched limousine cartel that had stifled competition in Las Vegas’ limousine market. Ricketts v. City of New York—The Institute for Justice successfully defended commuter-van entrepreneurs in 1999 in a fight against the government bus monopoly that would not allow any jitney entrepreneurs to provide service to consumers in underserved metropolitan neighborhoods in New York City. Jones v. Temmer—In 1995, IJ helped three entrepreneurs overcome Colorado’s protectionist taxicab monopoly to open Denver’s first new cab company in nearly 50 years. IJ used this victory to help break open government-sanctioned taxicab monopolies in Indianapolis and Cincinnati. Uqdah v. D.C. Board of Cosmetology—In 1993, IJ’s work in court and the court of public opinion led the District of Columbia to eliminate a 1938 Jim Crow-era licensing law against African-style hairbraiders. Md. Code Regs. 15.14.11.03-.04 (2008). Letter from Dr. Chris H. Runde, President, Maryland State Board of Veterinary Medical Examiners, to Maryland Licensed Chiropractors and Massage Therapists (undated), enclosed in Letter from James J. Vallone, Executive Director, Maryland Board of Chiropractic Examiners, to Kathleen J.P. Tabor (Mar. 4, 2008) (on file with the Institute for Justice). See, e.g., Dalia Colón, Mutt massages can boost your dog’s health, St. Petersburg Times, Apr. 18, 2008 (“According to animal massage therapists, dogs, cats, birds, guinea pigs and just about every other pet could use your loving touch), available at http://www.tampabay.com/features/pets/article461192.ece. http://www.wholehorsemassage.com; Henry C. Lukaski, Assessing Muscle Mass, in Human Body Composition 203 (Stephen B. Heymsfield et al. eds. 2005). Letter from John Paul O’Mara, President, Maryland State Board of Veterinary Medical Examiners, to Debranne Pattillo, President, Equinology, Inc. (Sept. 4, 2003) (on file with the Institute for Justice). 2003 AVMA Model Veterinary Practice Act §§ 2(7), 2(19)(a)(ii), available at http://www.avma.org/issues/policy/mvpa.asp. Md. Code Ann., Agric. § 2-301(g) (2008). Md. Code Ann., Health Occ. § 3-5A-05 (2008). Md. Code Regs. 10.43.17.02 (2008). Lee McGrath, A Primer on Occupational Licensing with Professor Morris Kleiner, available at http://www.ij.org/index.php?option=com_content&task=view&id=2057&Itemid=245. Acupressure is “the application of pressure (as with the thumbs or fingertips) to the same discrete points on the body stimulated in acupuncture that is used for its therapeutic effects (as the relief of tension or pain).” http://www.merriam-webster.com/dictionary/acupressure. Under Maryland law, animal acupressure is regulated identically with animal acupuncture, which does not require a veterinary license. Md. Code Ann., Agric. § 2-301(g)(11) (2008). See, e.g., Johnson v. Minnesota Board of Veterinary Medicine (http://www.ij.org/index.php?option=com_content&task=view&id=670&Itemid=240); Mitz v. Texas State Board of Veterinary Medical Examiners (http://www.ij.org/index.php?option=com_content&task=view&id=650&Itemid=240); Boone, et al. v. Texas State Board of Veterinary Medical Examiners, et al. (http://www.ij.org/index.php?option=com_content&task=view&id=2208&Itemid=240).